(1) At least one overnight stop, (2) requires a whole day, (3) requires more than half a day &ndash; you may have time for a few turns (4) arrive by lunchtime and ski all afternoon, (5) there is a main airport within an hour of Morzine. (1) There are no buses or taxis to Morzine, (3) there are slow or infrequent buses / trains available, (5) getting to the resort is easy with frequent bus / train connections. (1) No places to stay in/near Morzine, (3) a few places to stay in the resort, (5) a wide variety of accommodation suitable to suit all budgets. (1) No luxury accommodation available, (3) just one or two luxury hotels so book ahead, (5) several up-market hotels in Morzine. (1) There are no child care facilities at Morzine, (5) the resort has excellent child-care facilities including at least one reasonably priced creche. (1) Occasionally gets enough snow for skiing, (2) is often closed due to a lack of snow, (3) occasionally suffers from a lack of snow, (4) rarely suffers from a lack of snow, (5) Morzine is snowsure even in the poorest seasons. (1) Morzine relies entirely on natural snow, (3) there are just a few snow cannons, (5) there are snowmaking facilities on all pistes. (1) There are no snow groomers at Morzine, (3) occasionally some pistes are left ungroomed and in a poor state, (5) all the runs at Morzine are groomed daily. (1) there is nowhere to ski when it is windy or visibility is bad and lifts often shut, (3) there are some trees for poor visibility but main lifts sometimes close, (5) Morzine is mostly in forest where you can ski in flat-light and windy days, lifts rarely close. (1) If snow conditions are poor at Morzine, it will be poor everywhere nearby, (3) there are good alternatives within an hours drive, (5) other locations on the same lift pass provide a rich variety of snowsure ski conditions. (1) Morzine usually has poor snow conditions compared to other resorts in region, (3) has average conditions for the region, (5) usually has the best snow conditions in the region. (1) The staff at Morzine are rude or unhelpful, (5) lift staff at Morzine are pleasant, cheerful and eager to help. (1) The ski runs are featureless and unvaried, (3) the ski runs are varied but not extensive enough for a week, (5) Morzine has diverse and interesting pistes including forests and high alpine terrain. (1) No intermediate terrain at Morzine, (3) intermediate skiers will get bored after a few days, (5) vast areas of cruising runs. (1) Not even a kicker at Morzine, (3) average sized park quite well looked after, (5) huge park area and expertly crafted pipes, jumps and boardercross trails. (1) There is nowhere to go for cross-country skiing around Morzine, (3) there are some cross country trails available, (5) the area features many spectacular and well maintained cross-country trails. (1) No designated luge or toboggan runs, (3) there are toboggan runs that open quite often, (5) Morzine has long and well maintained luge / toboggan facilities suitable for all ages. (1) Overall, Morzine is one of the most expensive ski resorts in the country and not worth the money, (3) overall represents average value for money, (5) overall offers the best value resort in the country. (1) Overall, Morzine is one of the most expensive ski resorts in the world, (3) overall it offers pretty average value for money compared to resorts from other countries, (5) internationally the resort offers excellent value for money. You should all go to Morzine in the summer, biking. It's lovely and as for speaking French, I know hardly any but with a few choice words and a bad accent I put on they usually take pity on me... Les Gets is nice too but this summer we`re going to Chatel so hope it will be as good as all my previous stays as Morzine and Les Gets. Just read Andre's comment about the Brit's lack of French which reflects my previous comment. Come on, we've all done some school French, use it and stop expecting everyone to speak English! Agree totally with Andre's comments and have unfortunately seen the behaviour he is refering to all too often. Find it very amusing that comments have been made about the bus driver's English! We are in France! Can you imagine a French person getting on the bus here and expecting a bus driver to speak French!! How about brushing up on some French or at least apologise for not being able to speak French..... don't criticise them for not speaking English! Bizarre! Just a general thought! By the way, love Morzine in both summer and winter. We first learnt to ski in Morzine 18 years ago. We fell in love with the resort and now own and run our own catered Chalet des Etoiles in the village of St Jean D'Aulps just 10 minutes drive from Morzine. We prefer being away from the main town as it is really peaceful with amazing views and we have the advantage of accessing all the best places to ski in the comfort of our 4x4 vehicles. The Grande Terche on our doorstep is a hidden gem and not to be missed. Being just 75 minutes from Geneva Airport it makes a great weekend destination. In response to another reviewers comment about the English at Morzine: yes, I agree with everything you say but one thing: the French are way worse than any nationality I've encountered in the ski lifts. My board is now completely battered from the amount of people dragging their rental skis across it. That said, Morzine is a great resort and I'd recommend it to anyone. 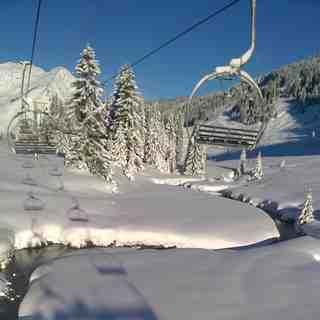 I love Morzine too, been coming several times a year for 10 years now and never tire of it. I do prefer January and March to Feb, which is busy. However, I can always lose the crowds pretty quickly. I rather agree with the comment of 'don't tell them how great it is, let them go to Val instead and fight'from another reviewer. Some friends think Val is the only place to ski but I didn't like it: too pushy and rude. Morzine has a better group of visitors all together ! Well, I got what I asked for at Morzine. Since the start of January it's been cold and dumped and dumped and dumped with snow. There's powder in all part of the PDS - try skiing Grande Terche or Les Gets for a day when the snow is this good. Just back from a weekend at Morzine. Conditions and piste area were superb as was ease of access to Morzine and within the town itself. We were unfortunate in that we had not the full chalet to ourselves and our English "yob" chalet mates made sure to insult, abuse and terrify everyone in our group including our hosts ! But that is not Morzine's fault - wonderful place, superb skiing ! 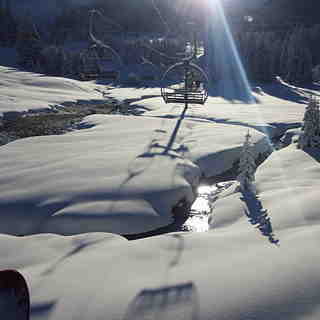 Morzine is a pleasant small town, with a good choice of bars and restaurants. The locals all seemed extremely friendly and helpful. Skiing wise, it is a fantastic area with a good lift network. The pistes were quiet while I was there (31/1/10-6/2/10), with hardly any queues for the lifts and superb snow conditions. A real gem. I'm French, and with my family we have a chalet in Morzine. Of course, has you have already read in these comments, it's a fantastic place for skiing, good snow and a very huge domain. People of the area are very nice with tourists. But I would like to point out a problem... Why UK people are so unpleasant? Did you have a minimum of education? Why is so difficult for you to learn some basic words as : Bonjour, merci, etc...? Why on lift queue you don't take care about other people? Maybe because you bring a lot of money or because you have buy a lot of flats... In my point of view, you have to feel that you are invited, and as a good guest, your behaviour has to be very thankful & nice. For example, after ski, in town centre, many people who are drunk & speaking loud, are speaking in English. Of course, this comment is not general for all people from UK.